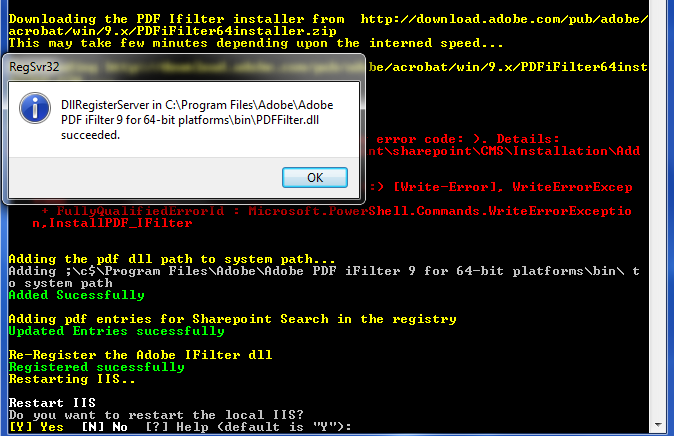 I have created a powershell script for Installing PDF filter in Sharepoint 2010 environment. I have tested it in Windows 2008 R2. Installing a PDF filter is a multi step process since it requires adding the icons in sharepoint _Layouts hive, adding registry entries for the filter, adding PDF extension to Search Service Application and updating DOCICON.XML file. I have splitted the whole deployment process into 8 steps right from downloading the necessary files from the Adobe site to unzipping and installing the resources. 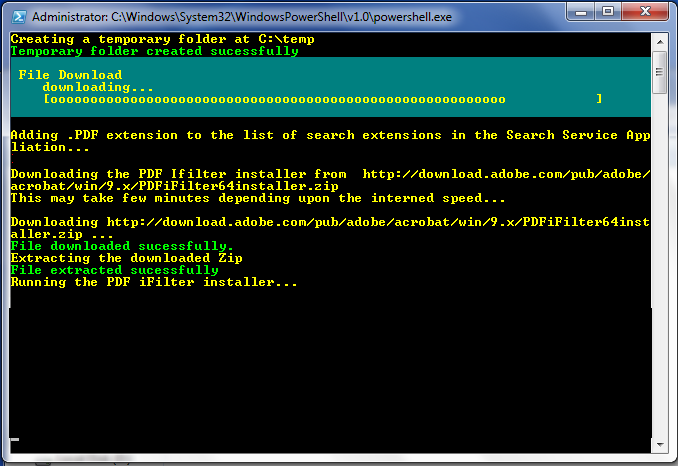 Below are the commands written in powershell for deploying PDF I filter for Sharepoint 2010. Copy the code and paste it in notepad and save with extension as .ps1. Now right click the file and click 'Run with powershell' to execute the code. $pdfIconDestinationPath = "\c$\Program Files\Common Files\Microsoft Shared\Web Server Extensions\14\TEMPLATE\IMAGES\pdf.gif"
$docIconXMLFilePath = "\c$\Program Files\Common Files\Microsoft Shared\Web Server Extensions\14\TEMPLATE\XML\DOCICON.XML"
$pdfDllSystemPath = "\c$\Program Files\Adobe\Adobe PDF iFilter 9 for 64-bit platforms\bin\"
$pdfDllPath = "C:\Program Files\Adobe\Adobe PDF iFilter 9 for 64-bit platforms\bin\PDFFilter.dll"
$clnt = new-object System.Net.WebClient -ErrorVariable err -ErrorAction "SilentlyContinue"
Write-Error "Error in download - Either wrong URL or Address not correct. Details: $err"
$ZIPfile = Get-Item $ZIPname -ErrorVariable err -ErrorAction "SilentlyContinue"
Write-Error "ERROR: $err Cannot find $ZIPname"
$ZIPfolder = Get-Item $destination -ErrorVariable err -ErrorAction "SilentlyContinue"
Write-Error "ERROR: $err Cannot find $ZIPfolder"
echo " $Path already in the path"
echo "Adding $VerifiedPathsToAdd to system path"
# Step 1: Create a temp folder for downloading the required files. copy-item "$tempfolder\pdf.gif" -destination $DestFile -ErrorVariable err -ErrorAction "SilentlyContinue"
Write-Error "Error occured. Details: $err"
Write-Error "Error: Search Service Application is missing. Details: $err"
$PDFcheck = get-SPEnterpriseSearchCrawlExtension "pdf" -SearchApplication $searchApp -ErrorVariable err -ErrorAction "SilentlyContinue"
Write-Error "Error Occured while adding .pdf extension: $err"
[xml]$dociconxml = get-content $XMLfile -ErrorVariable err -ErrorAction "SilentlyContinue"
Write-Error "XML not found: $err"
# Step 6: Download the PDF I Filter from Adobe Site. $proc = Start-Process C:\Windows\System32\msiexec.exe " /passive /i $tempfolder\PDFFilter64installer.msi" -wait -ErrorVariable err -ErrorAction "SilentlyContinue"
Write-Error "Installed with following error code: $LastExitCode). Details: $err"
$exitprompt = Read-Host "PDF Ifilter Installation Complete. Press ENTER to exit"
Download the ps1 file from here. Is this an environmental change across multiple WFE servers at once , or does it have to be executed on each WFE server? Great script! I hate having to do this manually. Also, I removed the /passive from the .msi install as it was throwing errors and i couldn't tell what was happening during the install. Thanks for the fixes, I have updated the powershell script and added the "SingleServer" option. However I have not removed /passive attribute and left for the users to decide whether they want to show errors or not.